Become a Transport Volunteer...drive our cat taxi! If you’re a confident driver with a clean driving record and would enjoy the company of some furry passengers, our Transport Volunteer role could be just right for you. Getting cats from A to B, our Transport Volunteers support us to give cats the best possible chances of finding their forever homes. Who can become a Transport Volunteer? All Transport Volunteers need to hold a full, clean driving licence and have no motoring convictions. You must have held your licence for at least 1 year and be confident driving around London, in a small manual van, possibly during peak times. We ask that Transport Volunteers are able to offer to contribute at least fours hours per fortnight of their time. This can be on a fixed day or can be arranged flexibly. Many of our Transport Volunteers will offer their time for this role in addition to another volunteering role within Cats Protection. What skills must I have to be a Transport Volunteer? We ask that you are physically able to complete the tasks required, which we do appreciate can be quite demanding as you will have to move cat carriers and equipment to and from the van. No previous cat care experience is necessary, but would be beneficial. What is the recruitment process for Transport Volunteers? To begin the process you will need to apply online. If your application is shortlisted you will be contacted for a telephone interview and we will complete reference checks. Successful applicants will then be invited to complete our in-house induction session, where you will learn more about Cats Protection and your role as a volunteer with us. You will then be offered a role-specific training session to provide you with practical training to prepare you for commencing your new role. You will also be required to complete a criminal conviction check for this role as there is lone-working involved. To apply for a role as a Transport Volunteer, please refer to our main volunteering page, which will give you details of our next volunteer recruitment dates and how to apply. “I can’t believe it’s been a year since I started volunteering. Retirement gave me the opportunity to do what I’ve always wanted to do – which is work with cats! 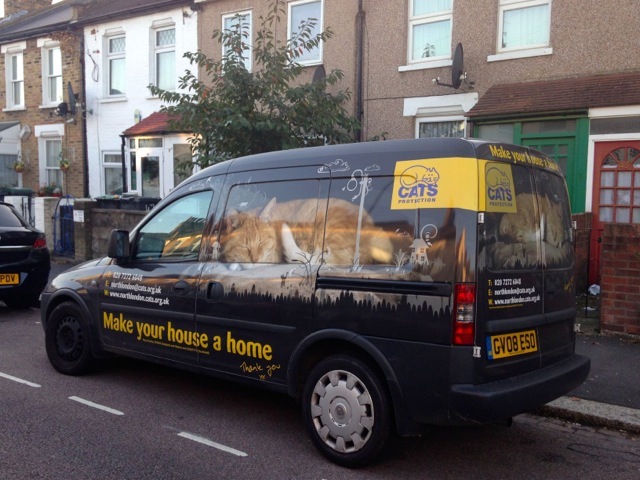 I’m a Transport Volunteer which means I drive that van with the gorgeous cat pictures on the sides around London. Usually, I'm collecting our furry friends from the other Cats Protection centres and bringing them back to the Centre to find their forever homes. It’s great fun and really rewarding. The traffic can drive you mad especially when my passengers all decide to complain! But we get there in the end and it’s great to see them find new homes.